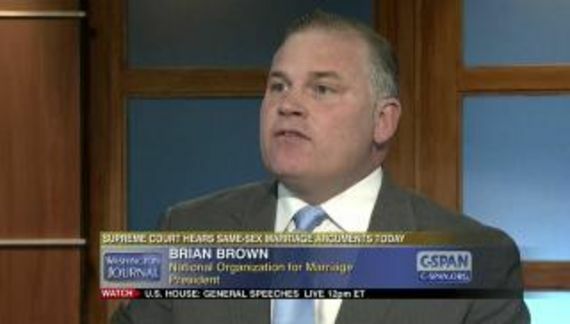 National Organization for Marriage may have found its reason to continue to exist and to continue the employment of Mr. Misadventure, Brian S. Brown. The new business plan is to send emails urging people to sign utterly pointless petitions to supposedly (though futilely) effect legislation one way or the other and then to take credit if things happen to go the way that they want. The required skills are the ability to identify anti-gay measures and then to write painfully verbose and dishonest appeals to NOM's email list. Resistance to reason and futility are important personal characteristics. Deal kowtowed to wealthy corporate interests who had already severely watered down the legislation by removing most of the needed protections, and then he showed himself to be a corporate lackey when billionaire sports owners and big business chieftains demanded that he veto even this modest protection for pastors, churches and religious groups. What hypocrisy! Billionaire sports owners and corporate CEOs can spend whatever they want fending off demands by LGBT extremists, but pastors and churches can't. That is why they need the protection of the law that Nathan Deal vetoed. Without this law, they will be subject to all kinds of legal maneuvers and pressure designed to force them to perform gay 'weddings' and make their facilities available for something that many consider to be sinful. The introduction to the petition and the petition itself are laughably verbose. Who is going to read all that batshit? More importantly this is a waste of keystrokes, pixels and bandwidth. The only people that state legislators care to listen to are their constituents. NOM has tracking code embedded in the petition URL in order to refine their list. I have made an effort but, thus far, I cannot find the single donor who kept NOM's lights on in 2014. With the apparent expense of two corporate offices (DC and Pennsylvania) and nothing to show for it, it is a marvel that Brown's confidence game has lasted this long.